I forgot to add the egg before taking a picture! Oh well, the egg was really good, but this picture will have to do. I loved this ramen I think mostly because of the sesame garlic tare. I had never heard of a tare before until I saw this post for vegetarian ramen bowls on A Side of Sweet. I looked up tare and it looks like it is the seasoning base for ramen that really gives it it punch. For example you might order a ramen with a miso tare or a soy sauce tare, and each restaurant has its unique recipe. I based my tare recipe a little on the one from A Side of Sweet and traded out the ginger for garlic. I found that the sesame paste was essential as it balanced out the sweetness with a little bitterness. The end result was nutty, garlicy, sweet, just a touch bitter, and very balanced. It was delicious! I could eat it by the spoon, stir it with dry noodles, eat it dipped with veggies it’s so good! The broth is made from charred vegetables and dried shiitake in a pressure cooker. In the picture I used a little fake protein, but it wasn’t very good and totally unnecessary since you have the egg. One thing I did forget to add is dried kombo (kelp). Next time. Place onion, garlic, ginger and carrot directly on different gas burners until charred, flipping over once. Place all ingredients in a pressure cooker with about 5 cups of water and cook for about 20 minutes. Strain and salt to taste. Saute garlic in 1 tablespoon of the sesame oil, removing half when tender and the rest once browned and a little burnt. Put all ingredients in a small food processor and blend until semi-smooth. Boil eggs until the white is firm, but the yolk is a little runny. I bring eggs to a boil, then turn off and run under water after 5 minutes. Saute mushrooms in a little sesame oil, sprinkle with salt. Heat corn (I used a microwave). Boil ramen according to the package directions. 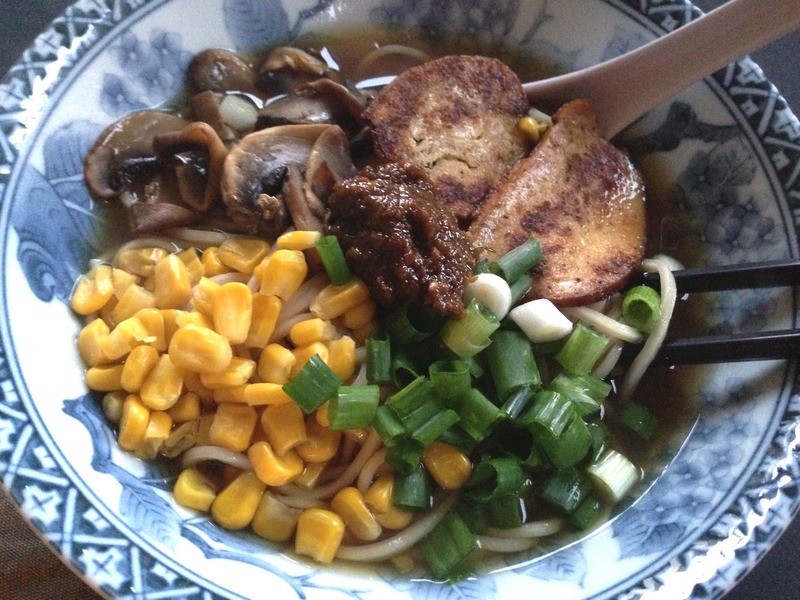 Put ramen in a bowl, pour over hot broth, then top with the sesame garlic tare, mushrooms, corn and green onions. Add chili flakes if you want a bit more spice without changing the overall flavor.